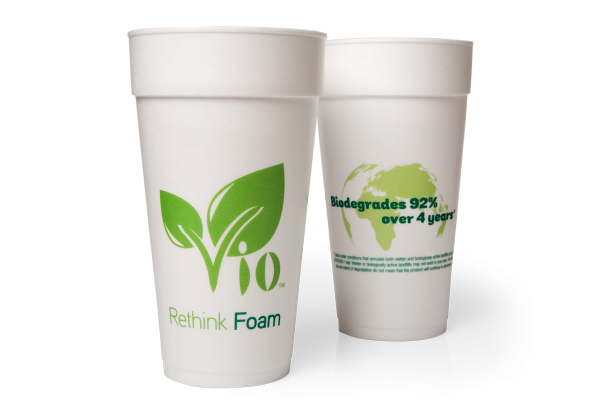 Your claim to being eco-conscious holds a lot more water (and coffee, tea and soda) when you serve to-go drinks in Vio® biodegradable* foam cups. Because Vio is the world’s first EPS (expandable polystyrene) cup specially treated to biodegrade*. At the same time, these cups deliver all the performance and cost advantages of traditional foam disposables — from keeping hot drinks hotter for longer (and vice versa for iced drinks) to low price. In fact, Vio is the lowest cost disposable cup of all the green options.